One of my favorite breweries is the Brasserie de Rochefort located in the Abbey of Notre Dame de Saint-Remy. It is one of seven Trappist breweries. (The other six being Chimay, Orval, Westmalle, Westvleteren, Achel, and Koningshoeven, a Dutch brewery and the only of the seven that is not in Belgium.) Rochefort brews three beers, Rochefort 6, 8 and 10. These beers can be difficult to find, if you can find them at all. And I have only seen Rochefort 8 and 10 in the US. Rochefort 8 (9.2% ABV) is my favorite, though I also love Rochefort 10 (11.3% ABV). I simply find 8 a touch easier to drink. All three are said to be brewed from an identical mash, just with varying amounts of candy sugar added to the boil in order to increase the initial gravity. If you have never tried them, I highly recommend it. Both the 8 and 10 are sweetish, viscous, dark beers. (rich brown in color) They are very complex ales with a very effervescent, fruity nose. The dark fruit aroma comes from a combination of the yeast, as well as rich flavors from the malt and caramelized candy sugar. The flavor closely follows the aroma, and the nachtrunk is long, rich and smooth. The Rochefort yeast is very fruity, but unlike other Trappist beers such as Achel and Chimay, it is not quite as phenolic and bananay. All are wonderful beers, but I find Rochefort to have a very bold and pleasing yeast profile with out the bite of some other Belgian ales. In addition, their beers are not nearly as dry as many Belgian ales. One thing really surprised me when researching Rochefort beers. Many of the clone recipes I found included coriander. I have consumed numerous Rocheforts over the years, and I have never detected coriander. Nor do I remember any dark Belgian beers being spiced. So I opened a 10, and sure enough, the power of suggestion took over. If I thought about it hard enough, I could detect some coriander. (Which smells like orange) But there are a lot of fruity aromas and flavors going on with Rochefort. So my question is, does anyone know definitively if Rochefort beers contain coriander or not? Some sources I found swear the spice is added, while others emphatically swear it is not. My guess would be that, even if one can imagine an orange aroma and flavor, that the beer does not contain coriander. My suspicion is that the aroma and flavors are byproducts of fruity yeast and a complex, high-gravity wort. Fueling the differing accounts, and I’m sure complicating matters, these monks don’t necessarily like to talk much, and especially when it comes to brewing secrets. So if anyone knows the answer, or even has an opinion, please add a comment. For those interested in the beer I brewed on Sunday, below are the details. After designing this beer, I compared it with the Dubbel recipe in Jamil Zainasheff and John Palmer’s book Brewing Classic Styles . My recipe was almost the same, all the way down to the grist ratios. So that made me feel better. If you do not know Jamil, he is a world-class homebrewer. He is on a different level in my opinion. I have great respect for him, and I found his book a great addition to my library. A couple of final notes. Note, I did not use coriander in by beer. Also, before you try to brew this, you may want to contact me to find out how it turns out. It is currently open fermenting in an 8 gallon enamel pot in my basement. For those that are not aware, Wyeast 1762, according to numerous reputable sources, is Rochefort’s yeast. 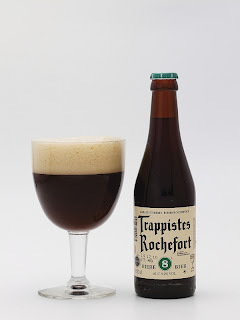 Since Rochefort is a beer dominated by yeast and malt/sugar flavors, having the proper yeast strain is a good start at a successful batch of beer. And when I open the lid to skim Kräusen, it definitely smells like fruity Rochefort yeast. Finally, the recipe above was mashed with a 20 minute protein rest at 122F, 40 minutes at 154F (until saccharification), at mashed out at 168F. It turned out great. See my previous post on the results: http://2009bdoty.com/?p=183. Let me know if you have any other questions.